Some oil and gas exporters, including Russia, are not receiving enough oil and gas revenue to meet their needs. They are not able to collect enough taxes to provide the services they have promised to their citizens, plus allow the amount of reinvestment that is needed to maintain production. Russia is starting to experience economic contraction because of the low revenue situation. This situation very closely related similar problems I have written about previously. In one post I talked about major independent oil companies not producing enough profit to provide the revenue needed for reinvestment, and because of this, cutting back on new investment. In another, I talked about the problem of too low US natural gas sales prices, relative to the cost of extraction. Some oil and gas importers, including Ukraine, are not using their imported oil and gas in productive enough ways that they are able to afford to pay the market price for oil and gas. Russia gave Ukraine a lower natural gas price because some of Russia’s pipelines cross Ukraine, and Ukraine must maintain the pipeline. But even with this lower natural gas price, Ukraine is behind on its payments to Russia. If a person thinks about the situation, it looks a lot like a situation where the world is reaching limits on oil and gas production. The marginal producers (including Russia) are being pushed out, at the same time that the marginal consumers (including Ukraine) are being pushed out. Russia is trying to fix this situation, as best it can. One part of its approach is to make certain that Ukraine will in fact pay at least the European market price for natural gas. To do this, Russia will make Ukraine prepay for its natural gas; otherwise it will cut off its gas supply. Russia is also looking for new customers who can afford to pay higher prices for natural gas. In particular, Russia is working on a contract to sell LNG to China, quite possibly reducing the amount of natural gas it has available to sell to Europe. Russia is also signing a $10 billion contract with Iran in which it promises to construct new hydroelectric and thermal energy plants in Iran, in return for oil exports from Iran. This contract will increase the amount of oil Russia has to sell, and will increase the oil available on the world market. Russia’s plan will do an end run around US and European sanctions. Gradually, or perhaps not so gradually, Russia’s exports are being redirected to those who can afford to pay higher prices. European Union purchases of natural gas imports have declined since 2008, presumably because they are having difficulty affording the current price of gas, so they are being relied on less for future sales. The Russian approach seems to include building a new axis of power, including Russia, China, Iran and perhaps other countries. This new axis of power may threaten the US dollar’s reserve currency status. With the dollar as reserve currency, the US has been able to buy far more goods from other countries than it sells to others. Putting an end to the US dollar as reserve currency would leave more and oil and gas for other countries. If purchases by the US are cut back, it will leave more oil and gas for other countries. The danger is that prices will drop too low because of the drop in US demand, leading to lower production. It this should happen, everyone might lose out. I am doubtful that Russia’s approach to fixing its problems will work. But if Russia is “between a rock and a hard place,” I can understand its willingness to try something very different. It now has more power than it has had in the past because of its oil and gas exports, and is willing to use that power. The US/European approach to this problem is to loan Ukraine $17 billion to pay for past natural gas bills. The hope is that with this loan, Ukraine will be able to make changes that will allow it to afford future natural gas bills. There is also the hope that the United States can step in with large natural gas exports to Europe and Ukraine. In addition, the US and Europe are trying to impose sanctions on Russia. I find it very difficult to believe that the US/European approach will work. The idea that the United States can start exporting huge amounts of natural gas to Europe in the near future borders on the bizarre. There are many hurdles that would need to be overcome for this to happen. Installing LNG export facilities is among the least of these hurdles. In fact, the West badly needs both the oil and gas that Russia is producing, so it really is in a very precarious position. If Russia cuts off exports, or if Russia is forced to cut off exports because of financial difficulties, both the US and Europe will suffer. It is clear that Europe will suffer because of its dependence on pipeline exports of oil and gas from Russia. But the US will suffer as well, because the US is tied closely to Europe by financial ties, and by import and export arrangements with Europe. Furthermore, the US/European approach involves a great deal of new debt, in an attempt to fix an inherent inability of the Ukrainian economy to afford high energy prices. Without a huge transformation, Ukraine will be in even more financial difficulty when it comes time to pay back the new debt–it will need make debt payments at the same time that it needs to pay for more expensive future natural gas. More debt doesn’t necessarily fix the situation; it may make it worse. The US powers that be do not understand what Russia (and the world) is up against, so the policies they propose are likely to make the situation worse, rather than better. We live in a world in which some countries use far more energy products than others. One question that the new proposed axis of power raises is whether this disproportionate share of energy use should be allowed to continue to exist. Figure 1. 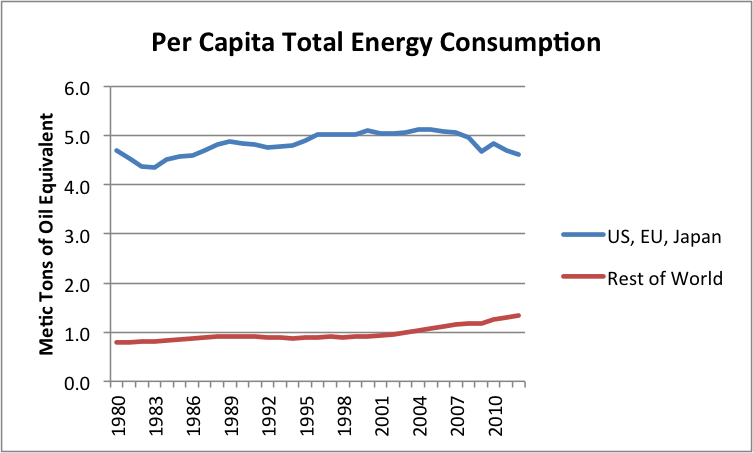 Per Capita Energy Consumption, based on BP 2013 Statistical Review of World Energy data and EIA population data. The United States, Europe and Japan got to the position of using a disproportionate share of energy resources by way of being first with industrialization. This early industrialization set up a pattern of using energy for “frivolous” things–large, heated homes; private passenger automobiles for individual citizens; businesses that were not necessarily as energy-efficient as they might be. In the early days, imports were limited and cheap. As local supplies became depleted, imports rose. The cost of imported oil and imported gas (except for natural gas in the US) rose as well, making the imported fuel harder to afford. Now the early users–that is, the US, EU, and Japan, are the ones struggling to keep up past consumption levels. In some ways, Ukraine is not too different from the EU is this respect. Ukraine also got to the position of using an above average share of energy resources, by being early in its industrialization, during the era of the Soviet Union. Ukraine, prior to the collapse of the Soviet Union, was using as much as energy on a per-capita basis as the US-Europe-Japan group (Figure 2), because of its heavy industry. Figure 2. 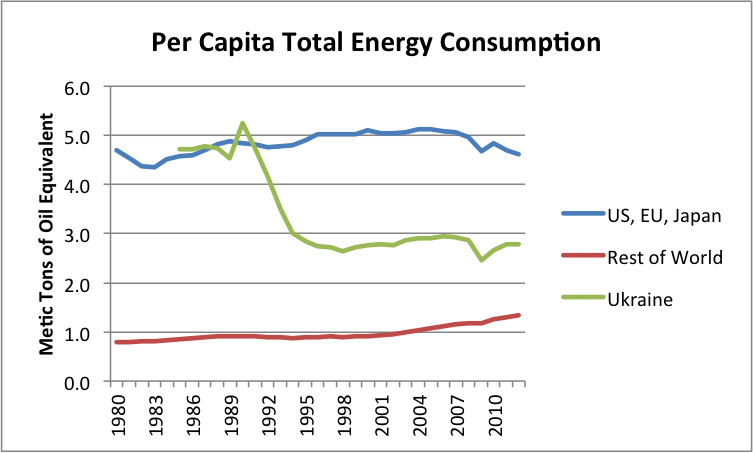 Figure similar to Figure 1, but including Ukraine’s per capita energy consumption as well. Once the Soviet Union collapsed, Ukraine had huge difficulties: Exports of oil and gas from Russia (upon which Ukraine’s industry depended) collapsed. Ukraine’s industry had been set up under the Soviet-Era model, and didn’t produce the variety of goods, cheaply, that people outside the Soviet Union expected to buy. Ukraine also didn’t have alternate sources of energy supply, if Russian supplies were cut off, because a major source of energy was pipelines of both oil and gas from Russia. The Ukrainian economy has struggled for many years. Trying to transform it now to be successful competitor in the world economy is likely to be a difficult task. If Ukraine tries to make goods for the world market, it will find itself in competition with Asian competitors. The Asians are hard to outcompete, in part because their labor costs are low (because it uses workers with little energy use, so they can live on low salaries) and in part because their energy costs are low (often from coal). Safety standards are often low as well, adding to their low-cost structure. If, instead of making goods for the world market, Ukraine decides to specialize in high-priced services, such as financial, medical, or educational services, it will find that it has a great deal of competition from the EU. It will also find that the EU is having difficulty making the service model work. The service model provides little for export, for one thing. Russia’s cost of producing oil is among the highest in the world. Mark Lewis, in a presentation at the November 2012 ASP-USA meeting estimated that Russia needed a price of $115.90 a barrel, to cover both its cost of extraction, plus Russian budget needs from taxes. If costs are rising at, say, 10% per year, the current required cost today would be about $134 barrel. Current oil prices are not much over $100 barrel, which is too low. Russia is the second largest oil exporter in the world (after Saudi Arabia), exporting approximately 7.2 million barrels a day. We in the rest of the world very badly need Russia’s oil exports to continue, to keep up world oil supply. Without this oil, the world economy would suffer badly. With respect to natural gas, Russia is the single largest exporter in the world (Figure 3, below), exporting more natural gas than all the Middle Eastern countries combined. The cost of producing Russia’s natural gas is likely very high, because Russia is extracting it from more and more difficult locations. Also, Russia is transporting this natural gas greater and greater distances. New pipelines or LNG facilities are necessary to facilitate this transportation, and these are expensive as well. Figure 3. 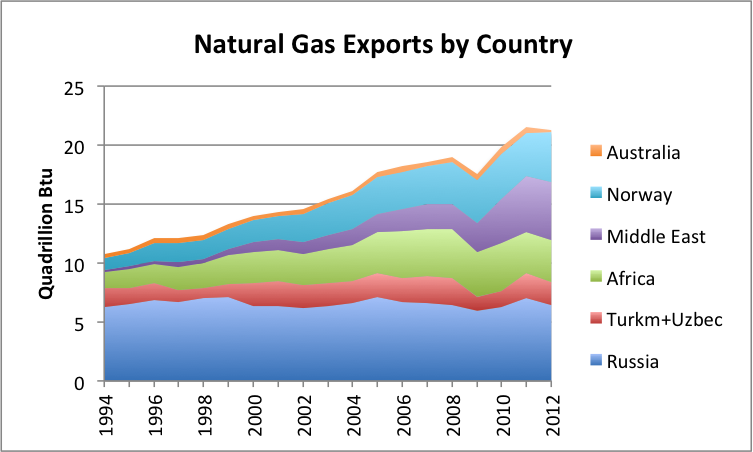 Natural gas exports by country, with some countries grouped. Exports from the New World are excluded, since they historically have mostly stayed in the New World. For example, Canada exports natural gas to the United States by pipeline. When an oil/natural gas exporter doesn’t get enough revenue, there is a danger of recession, or even collapse. A major part of the problem is that oil and gas exporters depend on tax revenue to fund government services, such as roads, schools, and public health. This tax revenue depends on profitability of the companies selling oil and gas. If prices are not high enough, tax revenue suffers. In fact, the 1991 collapse of the Soviet Union took place after a period of low oil prices made it impossible to justify investment in new more-expensive-to-extract fields. Russia began to recover once oil prices began rising again, making new investment oil investments profitable again. Ukraine has been a particular problem with respect to natural gas exports for Russia, because it has used a significant share of Russia’s natural gas exports, without paying market price for them (Figure 4). In fact, some of the time, it didn’t even pay the below-market price Ukraine had contracted for, for natural gas exports–the reason for Ukraine’s debt to Russia. Figure 4. 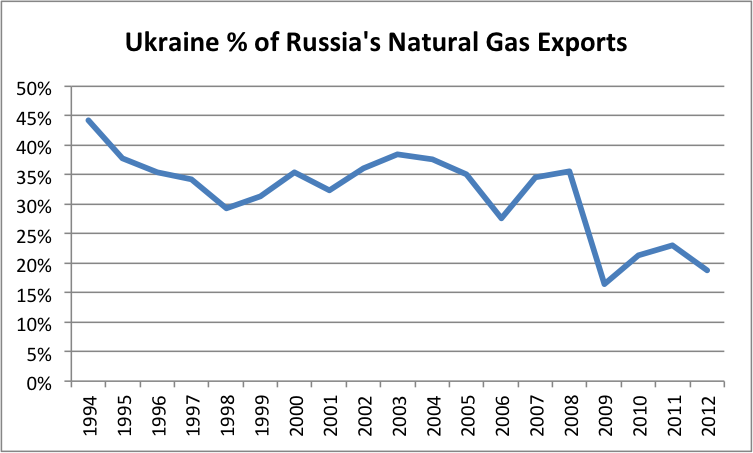 Ukraine natural gas imports as a percentage of Russia’s natural gas exports. Also, with Russia’s total natural gas exports close to flat (see Figure 3), the high exports to Ukraine have limited the amount available to members of the European Union. If Russia bases its economy on the sale of oil and natural gas, it needs a high enough average price, to fund its overall costs. Ukraine continues to need Russia, because Russia is the source of its oil and gas supplies. The IMF recently approved a $17 billion loan to the Ukraine, to pay off its debt to Russia and for other purposes. The loan is contingent on fiscal reforms, including a 50% increase in natural gas prices, raising taxes and freezing the minimum wage. My expectation is that the Ukrainian situation will spiral downward, with lower and lower energy use (because citizens won’t be able to afford the high cost of energy). Russia needs the US, because it is having trouble obtaining enough investment capital, because of current low oil prices. It needs to continue relationships with oil companies such as Exxon Mobil, hoping these companies will help provide investment capital. The catch is that they too are having difficulty. Exxon Mobil has reported falling profits for four quarters. The same Exxon article mentions that the company cut capital and exploration costs by 28% as a way of getting income and outgo back into line. So Exxon Mobil is “hurting” as well, for the same reason that Russia is hurting: inadequate oil and gas prices. To keep income in line with necessary expenditures, Russia has essentially no choice but to insist on higher prices from the country that is a big consumer, but can’t pay its bills–Ukraine. These higher prices are likely to push Ukraine’s economy down further, likely making the IMF loan impossible to repay. To Which Countries Can Russia’s Natural Gas Be Exported? 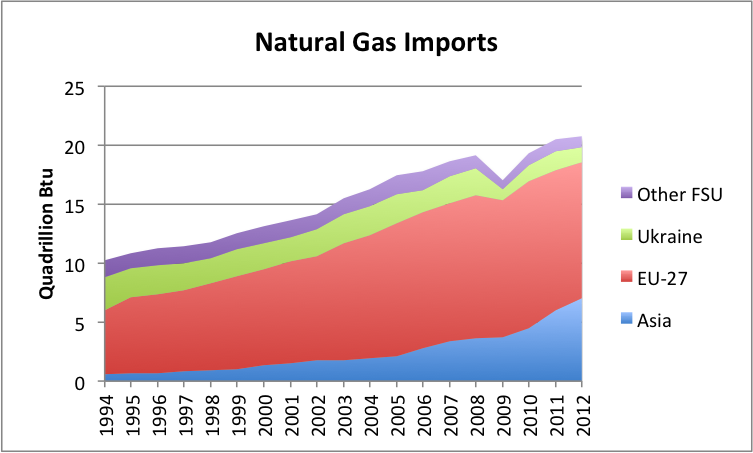 The market for Natural Gas imports is somewhat restricted, as shown in Figure 5, below. This chart includes natural gas imports from all sources, including the Middle East and Africa, not just Russia. I have omitted the Americas, because it currently tends to operate as a separate system, with the US, Canada, and Mexico connected by pipelines. Figure 5. Natural gas imports (excluding new world) by country grouping. FSU is “Former Soviet Union.” Based on EIA data. Chart omits Switzerland and other non-EU European natural gas importers. When it comes to finding locations for Russia to export natural gas to, the countries of the European Union are a large share of the natural gas market. (In Figure 5, I have omitted a few small European importers that are not part of the EU, and not part of the FSU, such as Switzerland, but this omission should be small.) Ukraine and other Former Soviet Union countries are gradually being squeezed out, because they cannot afford today’s natural gas prices. Asia is growing in its natural gas use. The prices paid in Asia have tended to be higher than in Europe (Figure 6, below), so it is natural for Russia to look to Asia as a growth area for its natural gas exports. Russia cannot easily walk away from the countries it currently exports to, because it needs natural gas revenue, and the pipelines are already in place. Can the United States Actually Help Ukraine with Natural Gas? Ukraine’s big problem with natural gas is that it can’t afford to pay market prices for it. This issue is likely to continue to be a huge problem in the future, regardless of which country is planning to export natural gas to it. Greece has had a similar problem, with inability to pay for natural gas imports from Russia. On my view, Ukraine’s inability to afford natural gas is its number one problem. The problem can be temporarily “papered over” with an IMF loan, but unless there are huge structural changes to the economy, the basic problem won’t be fixed. Let’s suppose that Ukraine actually finds money to pay for imports. Can the US provide the natural gas imports required? Can it also help with European imports? Many people look at the disparity in natural gas prices around the world (Figure 6), and expect that US can provide natural gas to Europe as well . Figure 6. 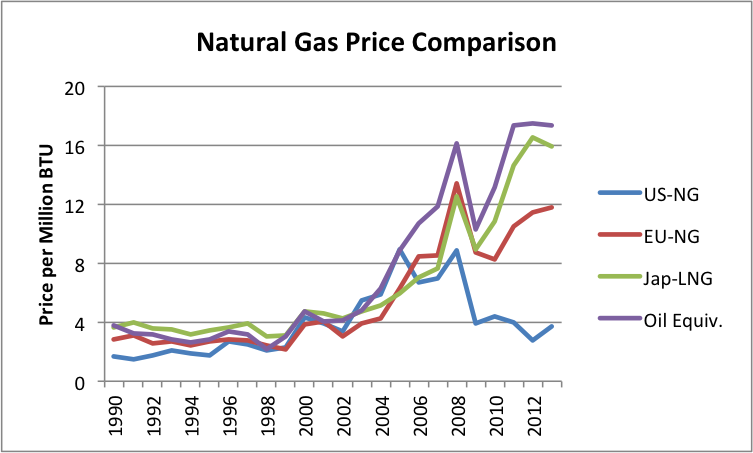 Comparison of natural gas prices based on World Bank “Pink Sheet” data. Also includes Pink Sheet world oil price on similar basis. If a person looks at the situation closely, it is hard to see that US exports will happen in large enough quantity, in a fast enough time frame, to make any difference. I recently wrote a post pointing out some of the issues, called The Absurdity of US Natural Gas Exports. I point out in that post that the United States is currently a natural gas importer. Our own natural gas in storage reservoirs is at record low levels, and there is concern that we may not be able to refill them in time for next winter. The amount of natural gas required by Europe is huge, if it were to try to replace Russia’s contribution. So we are talking about the need for a very large change for the US to be able to help Europe and the Ukraine. Much higher US natural gas prices than are currently the case, in order to make it economic to extract shale gas that seems to be present, but that is not economic to extract at this time. US natural gas prices would likely need to rise to two to three times current levels, perhaps to current European levels. The US economy would need to weather the storm that these higher natural gas prices would cause. Homeowners would find that the cost of heating their homes is much higher, but that their salaries are not any higher. Utilities that use natural gas would find that their sales price of electricity needs to be much higher, affecting both homes and businesses. The US economy would suddenly become much less competitive in the world market place, because of its higher cost structure compared to countries using coal as their primary fuel. To drill this huge number of wells, we would need many more drilling rigs. We would need many more engineers. We would need many more trucks hauling water for hydraulic fracturing fluid. In dry areas, we would likely need to transport the water required for fracking much longer distances than in the past. We would need to dispose of much more waste material, causing potentially many more problems with pollution and with earthquakes. We would need communities willing to put up with all of these problems, in order to help other countries in need of natural gas imports. Someone would need to build a huge number of LNG transport ships to carry all of this natural gas. It is not clear whether LNG import terminals would be needed as well–the ones currently in place tend to be underutilized. Many more pipelines would be needed, both in the US from the new wells to the terminals, and in Europe, connecting LNG terminals to the new users. Many of these pipelines will be used for only a short period of time, as wells deplete quickly. The cost of LNG the US will be able to send to Europe will likely be more expensive than current European natural gas prices, when the combination of the higher US natural gas cost, plus LNG transport cost, is considered. If there are new European natural gas imports, say from Israel, the additional high-priced natural gas from the US may not be needed. It is also not clear that Europeans will be able to afford the new expensive natural gas, either. The high-priced gas will tend to make the European economy shrink, because salaries will not rise to match the new higher costs. The US approach to the Russia /Ukraine situation reflects a serious misunderstanding of the situation. Russia has little choice but to try to raise the price of products it is selling, any way it can. It needs to cut out those who cannot afford its products, including Ukraine. If Europe increasingly cannot afford its products, Russia needs to find customers who can afford them. There is little chance that the United States is going to be able to help Europe with its natural gas needs in any reasonable timeframe. Our best chance at keeping the global economy “working” for a little longer is to try to keep globalization working as best we can. This will likely require “making nice” to countries we are unhappy with, and putting up with what looks like aggression. Policymakers like to think that the US has more power than it really does, and like to encourage stories suggesting great power in the press. Unfortunately, these stories are not true; we need policymakers who understand our real situation. This entry was posted in Alternatives to Oil, Financial Implications, News Related Post and tagged natural gas exports, natural gas imports, Russia, shale gas, Ukraine. Bookmark the permalink. 1. Peak oil and the lack of alternative sources of power. The lack of affordable fuel, the source literally of power, is about to take down the economy, the financial system, governments and industrial civilization as a whole. The collapse of our civilization? Its all about power, or rather the lack thereof. 2. Energy systems. Civilization is a complex dissipative system, comprised of layers of subsystems and a multitude of smaller DSs, if I got that right. Natural phenomena, including our persons, are all subject to the laws of thermodynamics. Their origin, development and decline are all understood as TDs. Again, its all about power. TDs are deterministic, if I got that bit right. Free will in the modern sense has no obvious place in that analysis. Free will is an illusion, we are driven by TDs. As FN might say, there is neither free will nor unfree will, just will (power). History as TDs. 3. Politics, geopolitics. Behind all the rhetoric and propaganda, its all about countries (and civilization as a whole) maximising their power, especially access to affordable energy and its consumption. Class politics are also obviously an attempt to maximise power and the consumption of energy for particular classes. Am I imagining things or is it all about power in its various senses? You are right–it is all about power, and balances of power. There is a lot more that is determined than what most of us would like. Sorry Gail. TDs = thermodynamics. I’m betting that wheat plays a big role in the Russian moves to control Ukraine. I believe Ukraine is a big wheat producing area and wheat shortages are looming with the weather getting more extreme than ever. Great post. When the South lost the Civil War and its slaves, it ended a way of life. Reconstruction was a just slow process of replacing slave labor with oil and other fossil energy. Now the whole country is losing its energy slaves. Everything you discuss in this post is really just a manifestation of a civilization trying to hang on to a living arrangement that has no future (ala JHK). Yes, we have a predicament because there will be no Reconstruction. Interesting times indeed! I also think that extinction is in the cards. No species has had more than a ~100,000 years before it overshoots its energy surplus, succumbs to it’s environmental poisons, and dies off. We are about there. I don’t lose sleep over it and the discourse is very stimulating. Thank you and your readers for the continued narrative. You have a good way of describing our predicament. I got a shock when I read about the pattern of species extinctions which is taking place that form a part of what is called the “Sixth Mass Extinction.” It turns out that man’s adverse influence on ecosystems didn’t start a few hundred years ago, when we started using fossil fuels. Instead it started way back, when man was still a hunter-gatherer, and there were fewer than 100,000 people on earth. Phase One began when the first modern humans began to disperse to different parts of the world about 100,000 years ago. Phase Two began about 10,000 years ago when humans turned to agriculture. Other news, UKIP and populists across Europe have changed the political landscape; Russia set off terror bombs in eastern Ukraine to try and disrupt upcoming elections. The world seems to be changing.